A high protein, triple layered, milk chocolate orange flavoured bar. With over 21g of protein and 2g of impact carbs, Carb Killa is a convenient way to consume additional protein between meals without adding unwanted carbs. Grenade Carb Killa should be consumed as part of a balanced diet. Product contains more than 10g/100g polyols: excessive consumption may cause laxative effects. Milk Chocolate With Sweetener 25% (Maltitol, Cocoa Butter, Whole Milk Powder, Cocoa Mass, Emulsifier: Soy Lecithin; Flavours), Milk Protein (Calcium Caseinate, Milk Protein Isolate, Whey Protein Isolate (Milk)), Bulking Agent: Polydextrose; Gelatine Hydrolysate, Humectant: Glycerol; Soy Protein, Soy Oil, Low Fat Cocoa, Skimmed Milk Powder, Sweetener: Xylitol, Sucralose; Tapioca Starch, Flavourings, Salt, Sunflower Oil, Emulsifier: Citric Acid Ester; Colours: Beta Carotene. For allergens see ingredients in bold. GMO free. No hydrogenated oils/fats. 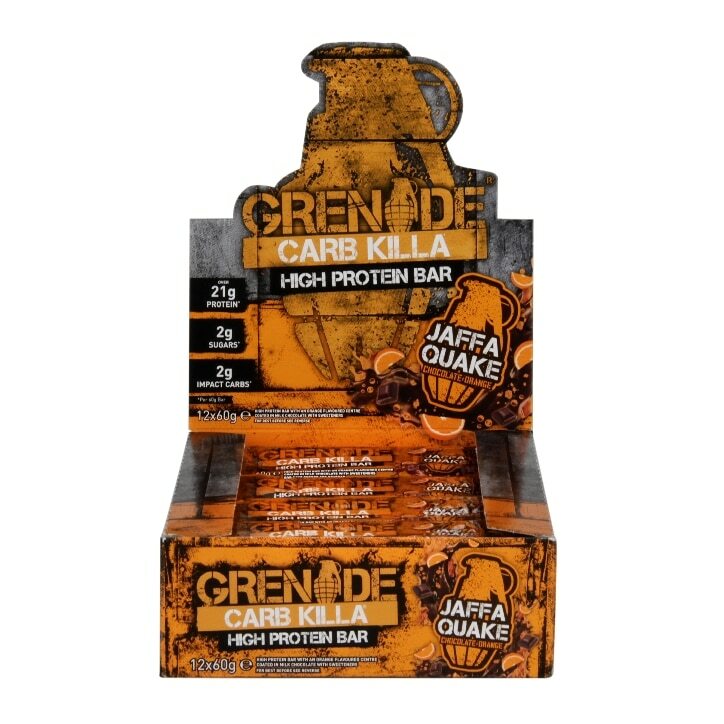 Grenade Carb Killa Bar Jaffa Quake is rated 4.9 out of 5 by 24. Rated 5 out of 5 by Queen_Hanya from Awesome! Actually had to stop what I was doing to make the most of the experience when I tried it for the first time. Real adventure of taste and love the crunchy bits! Go Grenade! Rated 5 out of 5 by AFWD from If you like Terry’s Choc Orange... I’ve tried all Carb Killas and LOVE most flavours but these are by far my favourite! Tastes like a naughty treat but with more protein, less carbs and less sugar! What more could you want!? Rated 5 out of 5 by RosieH from YUM!! Love these bars! This one is delicious if you like chocolate orange. They’re quite often on offer too...which is handy because they’re pricey...but irresistible!